“Grin, time to wake up,” Leslie says, as she unties my lashing. I try to open my eyes, but they are glued shut with sleepy-bugs. “Urrrahgghhh.” I groan. I don’t want to wake up. Leslie shoves me forward and back and forth a little bit. I resist her advances, refusing to hold my own bodyweight. She tries to peel apart my boat-fold, but I growl, “gggrrnnnnnnnnNO!” I flop back into place. “Wakie-wakie!” Andrew calls out. I scowl through my sleeps. Leslie peels back one side of my hull while Andrew yanks my other side free. They wedge my center bench into place. I sigh… “Okay, okay, I’m up, I’m up.” I rub my eyes, grumbling. I have had plenty of time to sleep, that’s the problem. I’ve gone into hibernation! With all these marinas we’ve been visiting, I’ve been lashed down on deck and of no use since we left Indonesia. Andrew and Leslie ignore my yawns and protests; I swing into the air on Sonrisa’s spinnaker halyard and Leslie drops me into the sea with a splash. As soon as I feel the water on my belly, I begin to perk up. I duck my nose into the water, stretch in each direction and take a look a round. I gasp! “Whooooaaaaaahhhhhhwwwww! Look, guys, look! Look! Look! A mangrove river!” Just off Sonrisa’s location on anchor is the mouth of a very interesting looking river, the mouth of which is marked by a stick inhabited by a pretty little bird at all hours except those in which the stick is under high tide. “These rivers don’t have crocodiles, Grin.” Leslie says. “They might!” I pout. Why does she have to be such a kill joy? “They have crabs, though. Millions of crabs who’s tiny little claws help them sneak aboard Sonrisa at night so they can nibble your eyeballs out while you sleep! See?” I point to the shore where a million lumps that look like rocks begin skittering about nervously at the presence of a bird. Look closer! Those rocks have eight legs! “We’ll go to shore after tide changes.” Leslie confirms. I huff. Why did they wake me up if they aren’t even ready to go. I pout and knock my nose into Sonrisa’s hull just to be a pest. She ignores me. Soon, she switches in the tide and my view changes. Across the way, is a continuous line of colorful, waterfront houses and workshops designed specifically to allow fishing boats to pull into the front yard like it’s a garage for cars. “Life, as it should be!” I think. Tide change takes forever. Eventually, though, Andrew and Leslie decide it’s time to visit town. They clamor down from Sonrisa and pull Kitty’s cord. “Aaaaannnnnnddd, we’re off!” I duck my nose into the wind and take off like a flash the five hundred yards to the ferry dock. We find a perfect spot to tie me up, and Andrew and Leslie disappear into town to explore. Ketam is a small island just off mainland Malaysia almost directly west of the capital city of Kuala Lumpur. It’s a colorful little village, built over the top of mangrove rivers. Its primary industry is fishing and seafood. They catch fish, squid, clams, and crab with dragging nets, floating nets, sinking nets, traps, or floating fish farms. Sonrisa has to be careful sailing here, lest she get tangled in a net that stretches on for a mile, but is only marked by floating white bobbers or maybe a tiny black flag. Andrew says its a wonder there are any fish left alive in this sea at all, but I think this comment is borne of his own piss-poor fishing luck. Even I can catch fish! I sang this guy a song, and he jumped right in! I digress. In Ketam, there are no vehicles at all. Bicycles, electric bicycles, and electric scooters are the only mode of transportation besides boats on the whole island. They zip around corners, up and over bridges, and along narrow cement walkways built over the water. Even the “garbage man” rides a bicycle. You have to be careful where you walk, otherwise a silent electricity driven blur may run you over on a blind curve. The population is 95% Chinese-Malay. So, everywhere you look throughout town or even tucked in people’s houses and shops are alters set with incense, fruit, and decorations to honor the ancestors. Andrew and Leslie buy three giant incense sticks at the local market. We are all impressed by how intricate the designs on are. Giant incense sticks go here! We are lucky. 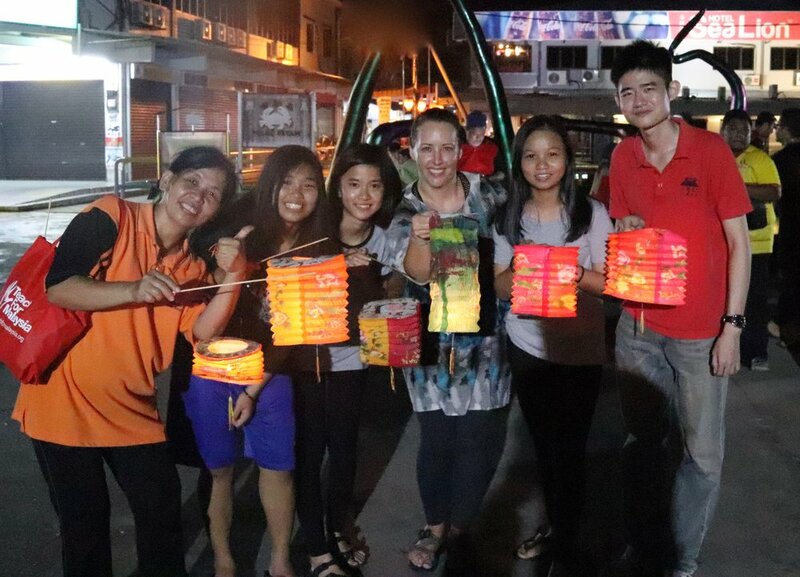 Without any plan at all, our trip happens to coincide with the fall moon festival. As a result, Andrew and Leslie are invited to participate in the celebrations, parading lanterns lit with small candles through the town. I wait for hours and hours while Andrew and Leslie explore town and eat. All they ever want to do is eat. Here, they make friends with the steam bun lady and enjoy a number of buns stuffed with a savory chicken and cashew paste and one stuffed with sweet kidney beans. Leslie likes the kidney bean bun, but Andrew hates it. Our second evening here, they sit down to what is the main attraction for Ketam: chili crab. They order a big steaming plate of vegetables, rice, clams, and two giant crabs bathed in what they describe as the most delicious sweet, hot, and smoky chili sauce, paired with a crisp Tiger Lager poured in a cup with ice (because that’s how they do it, here!) and hot tea for dessert. Andrew starts talking about moving on, and I get nervous. “Seriously?! No. Not before we go on our river adventure. You promised!” I don’t strictly remember them promising, but I’ve earned it! Kitty and I sat here waiting for hours on end at this ferry dock, and we only took one joyride with some kids who were playing about. We were back before Andrew and Leslie even noticed. “You know you’ll have fun, too!” My argument is lock solid. Look at that Grin-grin on Andrew’s face. Leslie was right, though. I didn’t see any crocodiles.